Though still capable of terrific stretches of unadorned action, shorthand atmosphere, and downbeat comic dialogue, Parker (the Spenser detective series) has become a painfully self-conscious prophet of liberated macho--especially here, with an obviously autobiographical hero: athletic, middle-aging Aaron Newman, who writes books "about courage and the matter of honor. . . ." Aaron witnesses a murder one day while out running, identifies the killer to the police--it's mobster Adolph Karl--but then refuses to testify, because Karl's thugs have terrorized his professor wife Janet and are threatening them both. But such knuckling-under means humiliation (and open-ended fear) for Aaron, so he starts thinking about killing Karl. . . and finds two eager accomplices in muscle-man neighbor Chris ("the Michelangelo of machismo") and tough-talking Janet. They stake out Karl's Boston-area home, scuffle with some thugs, and kill once in self-defense when Karl sends a hitman to Aaron's house. (Parker's nicest touch: the hitman's tender relationship with his spouse of 20 years.) 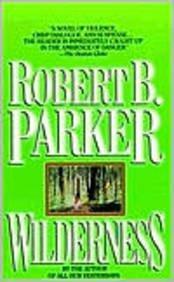 Then, increasingly impatient and bloodthirsty, the trio (Janet has learned to shoot) stalks Karl to his well-guarded woods-and-lake retreat in Maine--where Parker's already-tenuous control over tone and credibility pretty much collapses: the trio attempts to take on all five mobsters there, Janet kills, Chris is killed, Aaron says "Well, it's you and me now, babe," and (while running through the woods and preparing for a final showdown) they discuss their relationship, with lines like "The pressure of your thwarted romanticism is not pleasant. . . ." Yes, quite a pair, and all ends with some grisly hand-to-hand underwater combat between Aaron and Karl--and winking congratulations from the cops when they later find the thugs' bodies. The action itself is fine and gruesome, the non-marital dialogue is Parker-perfect. But too often this seems like a cut-rate, de-nuanced ripoff of Deliverance; and certainly Parker could have found a less contrived and melodramatic forum for examining the relationship between a sensitive macho man and an even more macho lady.